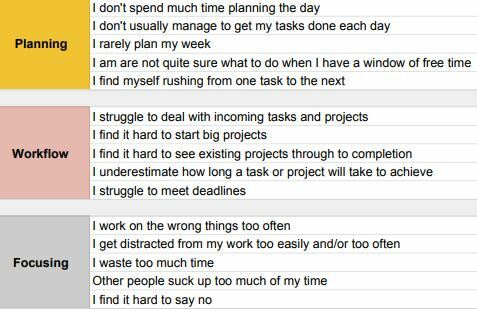 Have you ever done a Time Management Assessment? ...and those that could do with a bit of TLC. I've developed this one to help you accurately analyse exactly what it is you want to improve. Find out more below, or jump down the page to get it now. "What is a 'Personal Time Management Assessment'?" Built around a number of statements in several categories that relate to your time (and life) management, you'll rank yourself for each category, then weight each of those categories according to its importance to you (the exact instructions are on it). You'll soon work out what area you’re doing well in and what you need to work on. “What gets measured gets managed” is a great fit for this. Once you know where the most pressing issues lie you can focus your attention on tackling these first. "How will I receive the assessment?" Further down this page you can download and print it (PDF format). Alternatively contact me for an online version. "I haven't got a printer. Can I still do this?" Yes. You can view it on your screen and get the results with pen and paper (calculator too, if you've got one handy). I'm Tim Wilson, the guy behind this site. Find out more here. Yes. You can verify this by checking your address bar. You can download from Time Management Success safely and securely. "What do I do once I've done the assessment?" If you want to want to learn how to process your work and free up more time, explore Get Your Work Done, the e-book that accompanies the assessment.